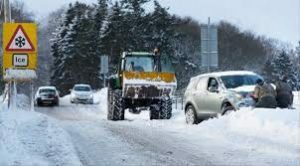 As a band of snow and ice is expected to hit Scotland, police have urged travellers to take care and plan ahead. The Met Office issued a yellow weather warning covering a large stretch of the country between 1am and 12 noon on Tuesday. Up to 10cm (4in) of snow on high ground has been forecast. Regions affected are central, south west, Tayside, Fife, Highlands and islands, Lothian, Borders and Strathclyde. Insp David Hynd said: “Warnings from the Met Office indicate that showers will turn increasingly to snow on higher ground then to lower levels later tonight and on Tuesday morning. Drivers should therefore exercise extra caution while this is in force. Five to 10cm of fresh snow is expected above about 200m with a cover of one to two cm at lower levels. It comes after a warning for ice was issued in the north east until 12:00 on Monday.